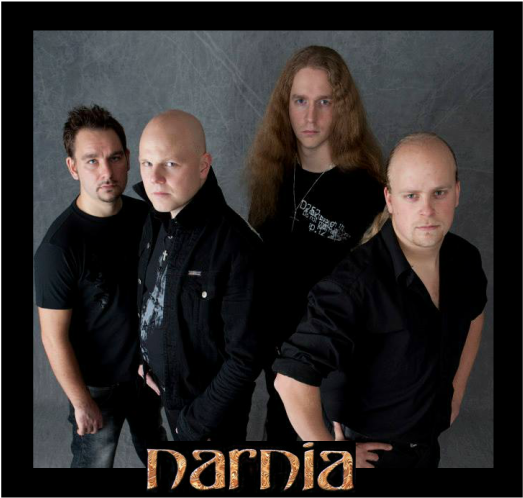 Narnia is a christian Melodic Metal/Power Metal band from Sweden that gets their inspiration from C.S. Lewis and his 7 novel success 'The Chronicles of Narnia'. The series borrows charracters from Greek and Roman mythology to convey christian themes. Narnia has borrowed some of the imagery from these 7 books to create some cool and interesting album covers along with some songs having inspiration from the series as well. 'Awakening' is Narnia's Debut release and had a humble beginning with the band being comprised of only two Swedish band members found in Christian Liljegren(Modest Attraction,Flagship,Wisdom Call, Audiovision, Divinefire,) and Carl Johan Grimmark(Saviour Machine, Rob Rock, Audiovision,Divinefire,Grimmark ).Carl handles all instruments except drums which were done on a drum machine and offers up some great shredding on this debut. Grimmark's shredding style has often been compared to Yngwie Malmsteen who also happens to be from Sweden. Every band struggles and does what it takes to get through the early years as we also find with the band 'Theocracy' who now is a power house but also started out small. Matt Smith handled Vocals and all instruments except drums which were done on a drum machine much like Narnia on this debut 'Awakening' album. The line up for 'Desert Land' is Christian Liljegren on Vocals, Carl Johan Grimmark on Guitars, Jacob Persson on Bass, Martin Claesson on Keyboards, and Andreas Johansson on Drums. 'Desert Land' has more of a 80's meets 90's sound to it with plenty of cool shredding from our axe man Johan Grimmark. The lyrics get very vague on this album which is strange due to the lyric offerings on 'Long Live The King' which were bold. On 'Desert Land' we find a song called "Revolution Of Mother Earth" that is so vague in what it is trying to convey. I will say this "that 'mother earth' is worshiped by "New Age" idolaters where they worship the earth as their provider and their everything. As Christians, If we are going to write a song about this new age goddess that has her roots in Mystery Babylon, then we need to be clear and bold about our christian stance and that those who worship and invoke "mother earth" need to repent and believe in Jesus alone. If you read the lyrics to all the songs on 'Desert land', the feeling you get is that the lyricist was tired maybe from too much touring and fast paced life styles. 'The Great Fall' finds Narnia with a mixed bag of European "lighter" Power Metal and Western "Heavier" Power Metal. Johan Grimmark really shows his diversity on this one which even includes some Bluesy Metal riffs found in the tune "Ground Zero". Sadly, we also find the band returning with more vague lyrics that are a bit on the darker side. However, the tune "No Time To Lose" speeks of salvation by Jesus and his work on the cross. As an added bonus, the last track "The Great Fall Of Man", we find a guest appearance by Eric Clayton(Saviour Machine). The Musicians on this disc are Christian Liljegren on Vocals, Carl Johan Grimmark on Guitars, Andreas Olsson on Bass, Martin Claesson on Keyboards, and Andreas Johansson on Drums. 'Enter The Gate' with its heavier sound, takes us back to the lyrical direction of their sophomore release 'Long Live The King' and is one of Narnia's best releases to date. We find Christian Liljegren on Vocals, Carl Johan Grimmark on Guitars and Keyboards, Andreas Olsson on Bass, and Andreas Johansson on Drums. Performed live in Owens, Germany back in 2003 this live compilation includes the songs "The Introduction","Inner Sanctum","The Mission","The Countdown Has Begun","Back From Hell","No Time To Lose","Long Live The King","Living Water","Shelter Through The Pain","Dangerous Game","Awakening","Break The Chains"and "The Witch And The Lion". The musicians are Christian Liljegren on Vocals, Carl Grimmark on Guitars, Andreas Olsson on Bass, Andreas Johansson on Drums, and Linus Kase on Keyboards.The production is very good for a live album and is a must have for serious fans of Narnia. 'Decade of Confession' is a compilation album of some of Narnia's best songs over the previous decade and is a good introduction to this Swedish band. 'Course Of A Generation' Finds Christian Liljegren moving aside and vocalist German Pascual stepping up to the microphone for this last release by Narnia. Musicians are German Pascual on Vocals, Carl Johan Grimmark on Guitars/Keyboards, Andreas Passmark on Bass, and Andreas Johansson on Drums. Pascual does a great job on vocals and is one of the better vocalist in the Metal market. However, the lyrics fall flat once again being some what vague with not enough references to Jesus Christ. The tunes often use He or You to describe God, failing to put spiritual meat on the table. However, there is a sufficient evangelical message here to make this a worth while purchase. Overall, Narnia has been a blessing to the Christian Metal community with their Metal offerings and Christian Liljegren has helped inspire and give other bands opportunities to make it in today's market. 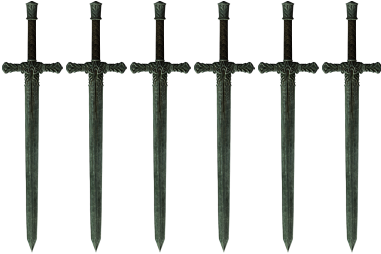 (See Site Info for Sword Scale Meaning)This rating is for both 'Long Live The King',& 'Enter The Gate'.